Product prices and availability are accurate as of 2019-04-08 19:40:46 EDT and are subject to change. Any price and availability information displayed on http://www.amazon.com/ at the time of purchase will apply to the purchase of this product. 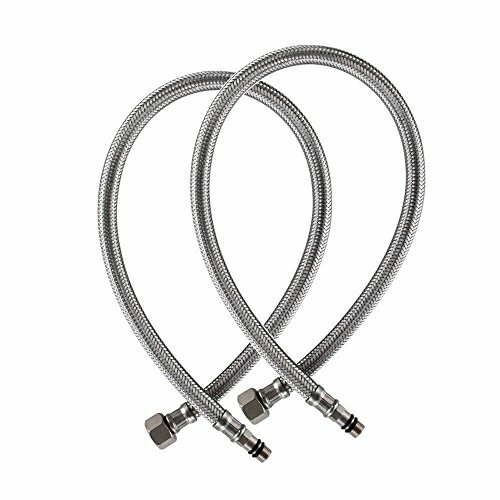 SPECIFICATIONS -Material : SUS304 Stainless Steel -Inner Tube Material : EPDM, high pressure resistance -Connnector : Brass, 1/2" female by M10 male Package Includes 2 x Supply Hose Buy from WEIRUN Quality stainless steel V.S. low grade steel, easy to rust Thick, non-recycled EPDM V.S. Thin, recycled M10 male vessel sink faucet connection. Fits most vessel sink faucets. 1/2" female Straight threads. M10 male vessel sink faucet connection Fits most bathroom and kitchen sink faucets. SUS304 Stainless steel braided exterior. Solid brass connector ensuring quality and longevity.